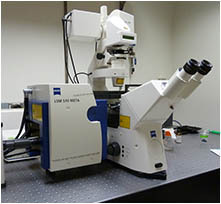 Inverted spinning disc confocal microscope Inverted spinning disc confocal microscope for high speed optical sectioning. 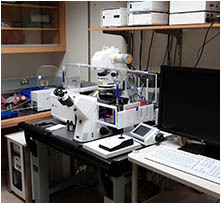 Spinning disk confocal microscopy offers several advantages over conventional optical microscopy, including wide-field and laser scanning confocal microscopy. 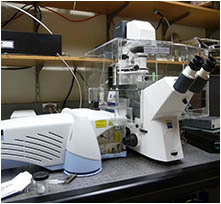 This confocal technique allows acquisition of images at very high frame rates with minimum illumination of samples. These qualities make Spinning Disc confocal microscopy particularly well suited to high speed 2D and 3D imaging of fixed cells and living systems with minimal photo-bleaching. 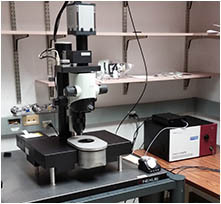 A spinning disc confocal scanner uses rotating disks with thousands of pinholes typically arranged in an Archimedean spiral. 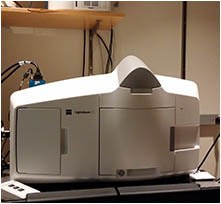 Since the disc has a fixed pinhole size, this microscope is only truly confocal at 63 to 100x magnifications. 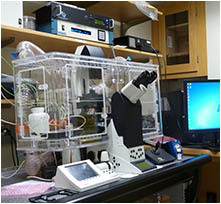 Location: Beckman Institute Basement Room B133D. 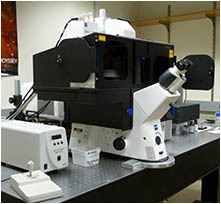 • This inverted microscope has the Yokogawa Spinning disk with micro-lenses and an EMCCD Camera for detection. • 3 Line Krypton-Argon mixed gas laser. • Motorized X,Y stage and Piezo Z focus. Stage: Prior with Piezo Z Focus. Laser Lines: 488 nm, 543 and 633. OS/Software: Windows 7 / Volocity Acq, Vis and Quant Software. Removable Media: DVD Burner, available USB hub, Network Access. Inverted microscope. 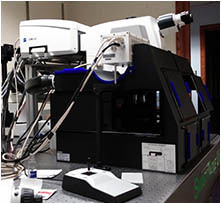 Laser scanning confocal. 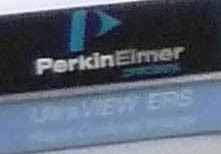 Two photon laser. In room B133G.